How Much Will It Cost to Tile My Floor? Floor tiles are one of the flooring options that can add colour and texture to your kitchen or bathroom. Ceramic floor tiles are larger and thicker than wall tiles in size so they can withstand the weight of foot traffic. Tiles come in different shapes and sizes, but if working on a budget then square and rectangular tiles are the best options. In addition to being cheaper to buy, they are also easier to lay compared to hexagonal or octagonal tiles. Each of the floor tile types has attractive properties such as durability for quarry tiles and the waterproof properties of vinyl tiles. Please continue reading to learn more about what a reasonable price would be for your job. It’s important to bear in mind that the cost of a kitchen or bathroom tiling job will depend on your selected tiles. For most projects homeowners will purchase their preferred type of tiles and then ask a tradesman to quote for fitting. An installation only quote may be the best way to go as it ensures you get the type of flooring you want, and you can control the costs for that aspect of the job. Tiles are the preferred flooring option for bathrooms because they are easy to clean and also waterproof. Floor tiling costs will, of course, depend on the size of the bathroom and the type of tiles chosen. It is recommended you chose your tiles and then look for installation only quotes. However, the price included in this example includes the cost of floor tiles, which are readily available from many DIY stores. We use an average price of £20-£25 per square metre, and the size of the bathroom is 8 square metres. Surface preparation especially if removing existing surface. The time spent on the job may also increase if it includes removing the existing floor. Ensure the price you are quoted covers all the work needed to have a new floor fitted. Select tiles with anti-slip properties to prevent nasty falls when wet. Make sure the base for laying the tiles is sufficiently waterproof. If you are going to carry out the tiling, yourself ensure you have the right tools to ensure a perfect finish. The kitchen is probably the single room that seems more traffic in nearly every home. For this reason, most homeowners want to go bold and make it look its best. Floor tiles are one way of achieving the look you want for your kitchen and this part of the article discusses kitchen floor tiling prices. As before, we assume the size of the kitchen is 8 square metres in size so as to have a pricing basis. All the other factors mentioned above that affect bathroom floor tiling costs apply here. 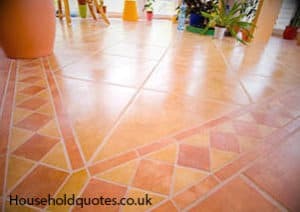 You may want to choose your floor tiles and buy them before looking for fitting quotes. Alternatively, you can just look for an all-in price if that makes it easier for you. Tiles – mid-range tiles have been selected which can be purchased at around £25 at local DIY stores. Tile grout and adhesive as required. Floor preparation that may include removing and disposing of the old floor. Taking into account the variation in costs across the UK, the cost for tiling a kitchen with the specification above is between £500 and £600. Finding a tradesman you can rely on to tile your kitchen or bathroom to perfection can be a challenge. However, having a single source where you can go and ask for quotations from tradesmen recommended by homeowners just like you is the smart way to go. RatedPeople provides such a platform and by going to filling in this short form, you can review the tradesman profiles as well as the feedback from past clients. Your new bathroom or kitchen floor is closer than you think, search for your tiling professional today. The area I need tiling is about 47 sq. metres it is a kitchen/living room/dining area and WC. I can provide a floor plan. Existing floor coverings to take up? I have a open plan for kitchen and living of 25sqm. It’s very difficult to get a cut of point between the 2 so if I go for tiling all the way through, in U.K. It will be too cold in winter ? What’s the best tile should I go for ceramic or porcelain or slate ? So it does not break easily. I am looking for marble type designs. How much will it cost if we go for under floor heating? Your advice will be much appreciated. Get Your FREE Floor Tiling Quotes NOW!